BOSTON - The Flyers had about as much success in Boston as the Dodgers. Thankfully for the orange and black, they leave Beantown having lost just one game as the Bruins shut out the Flyers, 3-0, Thursday night at TD Garden. How did the special teams let them down again, and why couldn't the Flyers solve Bruins backup goalie Jaroslav Halak? • Dave Hakstol had to be pleased defensively with the Flyers' first period when they gave the Bruins little open room on the defensive side of the red line. 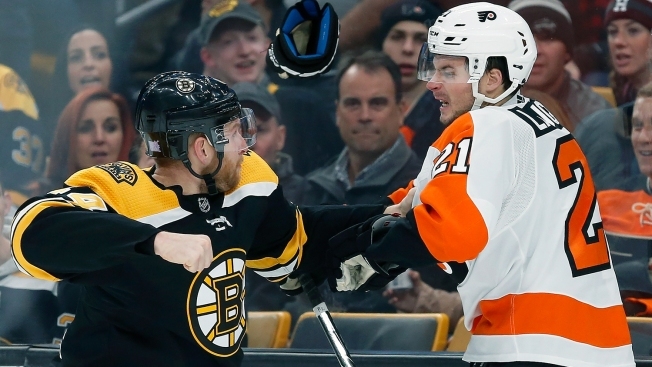 With the Bruins missing two key defensemen, the Flyers failed to get in strong on the forecheck and put some pressure on an injury-plagued Boston blue line without Torey Krug and Charlie McAvoy. • The four-game absence seemed to help Andrew MacDonald, who looked like he had the burst in his skating that was missing in his first five games. He told me the biggest area that would be noticeable would be in his pivots in 1-on-1 defending. As much as he's disliked, a healthy MacDonald is essential for this team to have three solid D-pairings. Unfortunately, "A-Mac" had the turnover that led to Zdeno Chara's big blast that gave the Bruins a 1-0 lead. • Scott Laughton did a tremendous job of keeping the game scoreless as he hustled back and broke up a 2-on-1 backchecking Brad Marchand by tying up the stick. Plays like that are a big reason why Laughton has been one of the Flyers' best two-way forwards this season. Thursday marked the 200th career game for Laughton and clearly, the past 100 games have seen a significantly different player. • Not only did the Flyers gift the Bruins a power play with a too-many-men on the ice minor, but the coverage between MacDonald and Robert Hagg on the penalty kill also completely broke down, allowing Jake DeBrusk and David Krejci to work a give-and-go play that left DeBrusk unattended and unaccounted for. DeBrusk redirected an easy goal. • After playing a solid, structured game through the first 30 minutes, the Flyers started to get a little sloppy with their gaps, leaving the defensemen to make long stretch passes to the forwards. When that happens, several bad things can take place. There's a higher frequency of icing and/or those long passes are more prone to being intercepted in the neutral zone. • The Flyers were given a golden opportunity to claw their way back into this game with back-to-back power-play opportunities midway through the third period, but they couldn't convert on either one, as the power play didn't make the Bruins work hard in the process. The passing is predictable and the team is simply trying to funnel shots inside the goal mouth while looking for a tip-in. • You have to wonder had the Flyers been able to trade Michal Neuvirth this summer, how strongly they would have pursued Halak, who signed a two-year, $5.5 million contract with the Bruins on July 1. Halak was the difference as he was in control and in position for the full 60 minutes. He stonewalled Claude Giroux on three different occasions and simply made Thursday's 26-save effort look relatively easy.